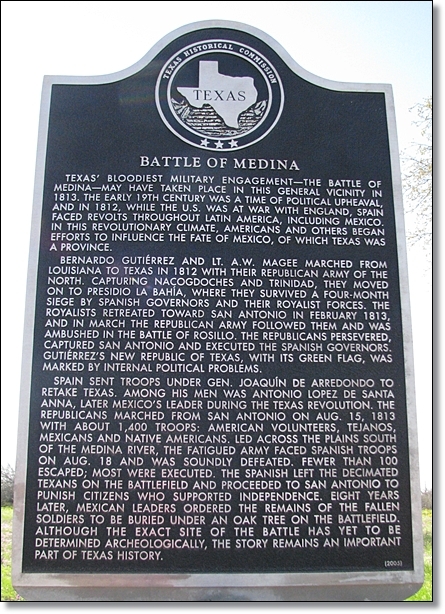 On August 18th, 1813 ourTejano, American and Indegenous Ancestors set out to fight in what would become known as the biggest and bloodiest battle ever fought on Texas soil; the Battle of Medina. Twenty three years before the Alamo our ancestors would meet a mighty Spanish army where they would fight to the last man. After 300 years of Spanish tyranny they chose to fight and die on their feet rather than to continue to live on their knees. On August 7th, 1812 Bernardo Gutierrez de Lara Y Uribe and Augustus Magee crossed the Sabine River flying the Emerald Green Flag of the First Texas Republic. This Green Flag would fly over Texas for 1 year and 11 days and under this flag our ancestors would declare their Independence on April 6th, 1813. Unfortunetly Spain was still a super power and would send a powerful Spanish Army to quash the republic. This army would be led by General Juaquin de Arredondo who had earned the nick name “El Carnicero,” the butcher. He had earned that title because the previous year he had murdered hundreds of Mayan Indians in the Yucatan Peninsula for daring to revolt against his Spanish King. Under Arredondos command would be a young 19 year old Lt Jose Antonio Lopez de Santa Anna who would be back 23 years later to fight in yet another revolution. At the Battle of Medina the Republicans numbered 1400 combatants, comprised of 900 Tejanos, 300 US Citizens and 200 Lipan Apaches. They would face a Spanish Army with 1830 well armed, and well trained disciplined men. The Republicans were lured into a trap which resulted in over 300 Republicans falling dead or mortally wounded in this first volley; but the battle raged on for over 3 hours. Our Tejano ancestors would charge on the left trying to out flank the Spanish and then again to the right to no avail, suffering heavy losses. There was so much smoke and dust on the field of battle no one was sure who was winning. Suddenly, over the shouts of wounded and dying men a gust of wind cleared the field of all the dust and Arredondo realized he was winning and orders his bugler to sound the bayonet charge. After the battle, over 900 bodies were left to rot on the battle field for over nine years. Another 100 would be captured and executed as they tried to escape to Louisiana. Charging into San Antonio the Spanish Cavalry arrested over 400 Tejanos suspected of supporting the rebels. The following morning several are released but 327 would be detained. Ten a day would be taken out and shot, numerous would be beheaded and their heads placed on spikes and displayed around Military Plaza. No one would be spared the wrath of Arredondo not even the women or children. Over 400 wives, mothers and daughters of the Tejanos were forced on their knees from 4 in the morning to ten at night to grind the corn to make the tortillas to feed the dispised Spanish Army; several of the women would be brutally and repeatedly raped several dying as a result of the brutality and through the windows of their make shift prison the mothers could see their children searching for food and shelter. So disastrous was this event that one third of our Tejano community would be dead, one third would flee to Louisiana and the remaining third would live in terror. To this day these unsung heroes have remained unknown and unrecognized for their ultimate sacrifice.